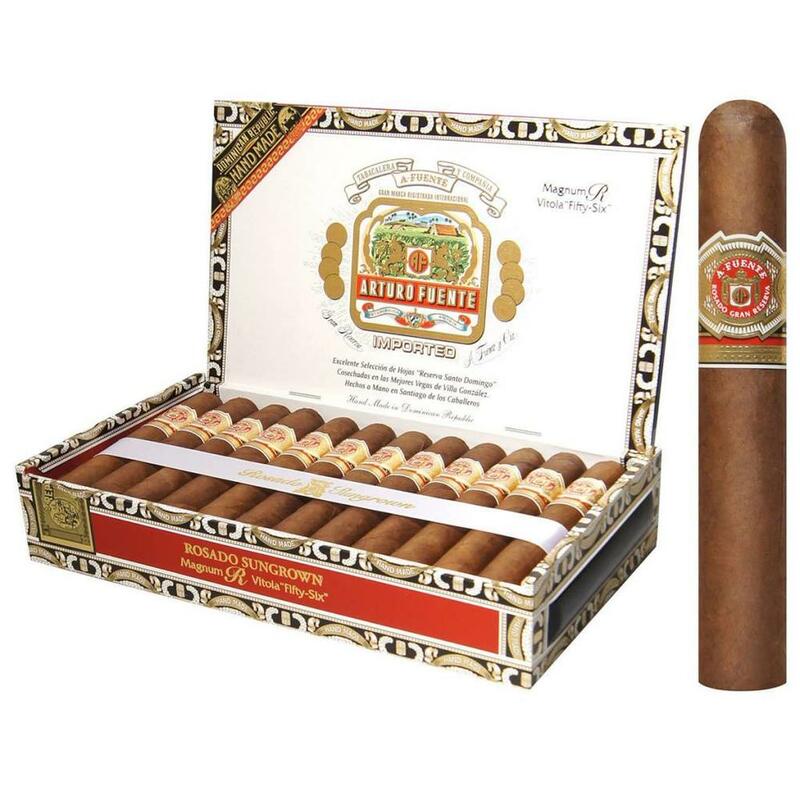 The Fuente Rosado Gran Reserva Sungrown Magnum R highlights the incredible workmanship, meticulous aging and overall standard of quality that the company is known for. This mild to medium-bodied stogie is hand crafted with a beautiful Rosado Sun Grown wrapper and Fuente’s signature Dominican filler and binder. The rosy brown wrapper is finely aged for 8 to 10 years allowing a silky smooth mellow experience with a touch of sweetness. The classic flavors range from roasted nuts to cedar then moves on to aspects of leather. Arturo Fuente's Rosado Sungrown Magnum R 56 is enjoyable to seasoned smokers and beginners alike. It is destined to become a classic Fuente fan favorite. Rosado Gran Reserva Sungrown is meant to stand apart from the rest of Fuente’s lines and the seasonal releases. The friendly price makes it worth seeking out in a box if you’re lucky enough to find them. Once you do find them, shopping online or otherwise, latch on to them! This beauty is meant to be savored. This is my go to cigar in the summer, but anytime of the year is great. On a long lazy afternoon is the perfect time to enjoy a Rosado R 56, along with a tequila. Although one rarely (never?) pairs cigars with white or clear liquors, such as vodka and gin, I prefer to drink a lighter tequila with the Rosado Sungrown. Maestro Dobel Diamond Tequila is a blend of the Reposado, Anejo and Extra-Anejo tequilas The aroma is delicate with hints of oak, vanilla and honey. The tequila is full-bodied but very smooth on the palate This tequila pairs well with the milder Rosado Gran Reserva Sungrown Magnum R. Trust me, you are gonna love these two together!